5-Axis HYBRID O.I.S. +*/*5-Axis compensation works in video recording except for 4K video or high-speed video recording. Expressive / Retro / Old Days / High Key / Low Key / Sepia / Monochrome / Dynamic Monochrome / Rough Monochrome* / Silky Monochrome* / Impressive Art / High Dynamic / Cross Process / Toy Effect / Toy Pop / Bleach Bypass / Miniature Effect / Soft Focus* / Fantasy / Star Filter* / One Point Color / Sunshine* (22 filters) *For photos only. Clear Portrait, Silky Skin, Backlit Softness, Clear in Backlight, Relaxing Tone, Sweet Child's Face, Distinct Scenery, Bright Blue Sky, Romantic Sunset Glow, Vivid Sunset Glow, Glistening Water*, Clear Nightscape, Cool Night Sky, Warm Glowing Nightscape, Artistic Nightscape, Glittering Illuminations*, Handheld Night Shot, Clear Night Portrait, Soft Image of a Flower*, Appetizing Food, Cute Dessert, Freeze Animal Motion, Clear Sports Shot, Monochrome *For photos only. Contrast, Sharpness, Noise Reduction, Saturation*, Color Tone**, Filter Effect**, Grain Effect**/*Except for Monochrome mode. **For Monochrome mode only. 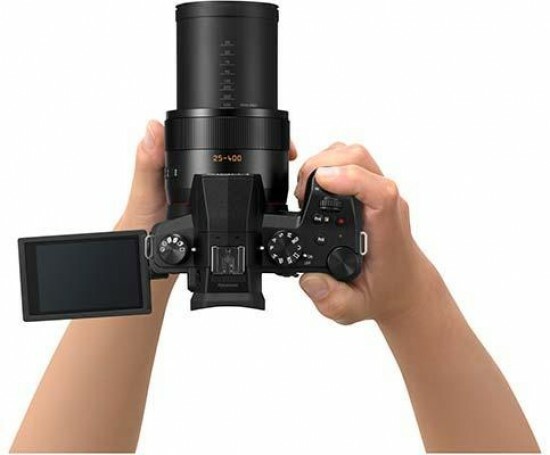 ・ Operating Instructions for advanced features is available for downloaded at Panasonic LUMIX Customer Support Site using PC, smartphone or tablet connected to the Internet. - Temperature: 23 oC (73.4 oF) / Humidity: 50%RH when monitor is on. - Recording stops when the continuous recording time exceeds 29 minutes and 59 seconds with [AVCHD]. - Recording stops when the continuous recording time exceeds 29 minutes and 59 seconds with [MP4] in [FHD] [HD] and [High Speed Video]. *3 For [4K] video output, use an HDMI cable that has the HDMI logo on it, and that is described as"4K compatible".